Sometimes I find that returns can be cheaper than singles. I remember once waiting in the queue at Brighton and the sales person was trying to explain to someone that they really should buy a day return rather than a single as the day return was cheaper. The passenger just struggled to understand and insisted on a single. So there are some ticket offices who are trying to sell cheaper tickets. I’ve found that with the day returns being 5p to a £1 more expensive than the single is a great thing if I want to take the train somewhere and then cycle home, but also have an “insurance” that I can hop on the train on the same line and get home if needed. However on the flip side if I want to take the train out to station A and then cycle to station B and take the train from there, when stations A and B are on different lines, then I need to get two singles usually due to them being on different lines. Though I have had a conductor allow me to do an A – B out and B – C return, on a last minute change of plan. The difference in the ticket price was about 5 or 10p, and it would have cost massively more to try and get a ticket extension or try to work out the appropriate ticket, which is probably why he didn’t even want to try. Thanks for the observations about single fares. My feeling is that off-peak return fares have prices which can be justified, whereas singles are rather opportunistically priced. I find the relatively high price of singles easier to accept for short distance journeys where passengers are used to getting better value for money from tickets allowing multiple journeys (e.g. travelcards). However, the rail companies should at least always have a single which is cheaper than a return (even if only slightly) otherwise it makes them look clueless, and leaves the passenger wondering if they have been sold the wrong ticket. Your example of A-B out and B-C return is a good example of where the passenger can end up paying double just because stations are on different lines. For long distance journeys the costs are much more significant so I think having huge disparities in the price per mile for Off-Peak Singles and Returns is difficult to justify. The low cost airlines have embraced the flexibility of selling singles, whereas the rail industry has ended up with their mixture of bizarrely priced singles and returns with complex restrictions often different in each direction making it very difficult for a passenger to work out what is best. 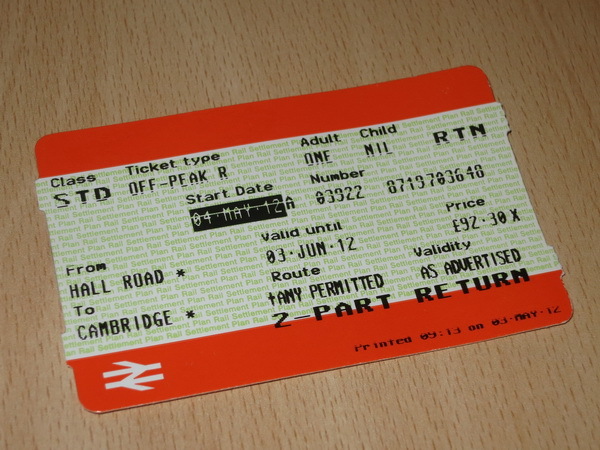 A passenger’s outward and return journeys may have different criteria, but the financial advantages of buying an off-peak return may force the passenger into buying this, whereas a better balanced fares system may have allowed them to mix the appropriate anytime, off-peak or advance tickets for each part of their journey. Just to add, there are a couple of signs that some operators do appreciate there is a problem with high priced Off-Peak Singles. First Great Western have reduced the price of their Off-Peak singles so they are now closer to half the price of the return (e.g. Super Off-Peak London to Swansea is £73 return £42 single). I know what you mean, I was looking the other day for a cheap return ticket from Birmingham to London, and was browsing on thetrainline.com, and the cheapest ticket offered was a combination of singles that would have cost about £35 on London Midlands service from Birmingham New Street to London Euston. However, I then on the off-chance went direct to London Midlands’ website, and they were offering off-peak returns for £18.09 from New Street to Euston. It really does pay to shop around!